Made of 100% Soy Wax in a clear plastic tea light cup with a natural paper wick. Our testers have burned anywhere from 4 1/2 to as long as 7 1/2 hours but burn time will vary. 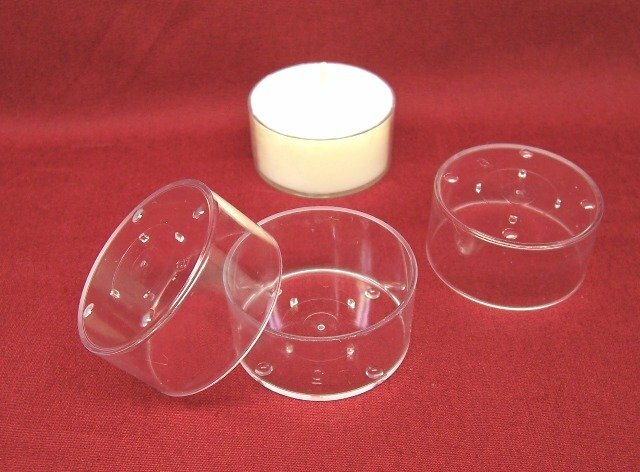 These tealights measure 1 9/16" across and 3/4" high. Natural soy wax color varies from a light off white to slightly pale yellow (usually off white). Loose bulk packed in a simple seal top bag for great wholesale pricing! (you may want to wipe these clean if they're going to be on display). Drop shipping is no longer an option for this item. These candles are handmade. It's the nature of soybean wax to shrink a little as it cools. We do a second pour on the surface to minimize it but some will have rough tops, some shiny, others dull, and others will be smoother or may have a little white "frosting". You might notice a line between the pour layers. Shaded areas are where the wax has shrank away from the container. 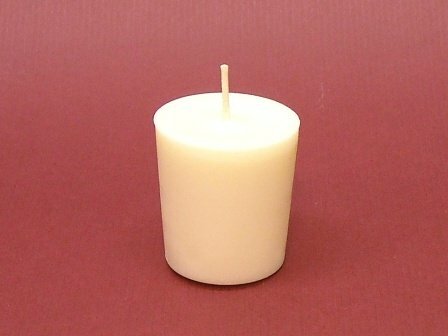 We've tested many candles that had off-centered wicks and some that appeared to be over-filled and they didn't run over. They all burn long and safely, and after all, that is what they are made for. These used to be made by Enchanted Lites (Soy Basics/Bean Pod Candles) using the EL Soy Votive Wax and a natural PK7 paper wick there is no fragrance or dye, just pure clean ambience. Our testers had burned as long as 12 hours but burn time will vary. These votives measured about 1 3/4" across the top and 1 7/8" high and 1 7/16" across the bottom. Soy votive candles should always be burned in a glass votive holder...not a plate.